Pencil-like sketch of a Baltimore oriole nest. One oriole looks out from within their nest while the other stands guard at the entrance. This uncomplicated oriole picture might just be the black and white bird drawing you need for your next creative project. 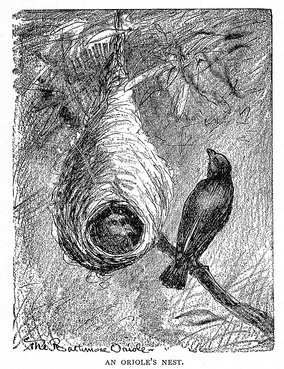 If you like vintage drawings of birds and their nests, be sure to check out Drawings of Bird Nests, an entire category full of drawings like this one. When the illustrator is Harrison Weir (1824-1906) you know the drawing is going to be interesting. This one is one of many from an 1889 book he worked on called Bird Tales.